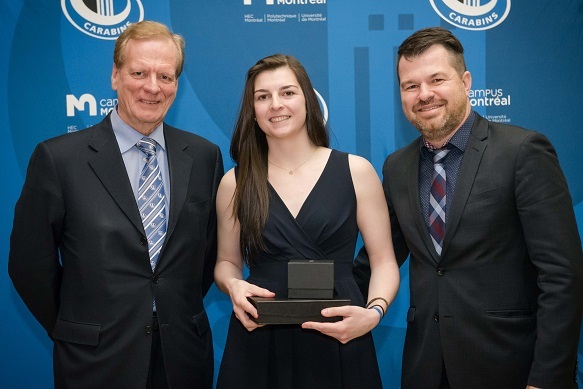 Hockey goalie Marie-Pier Chabot, a Bachelor of Business Administration (BBA) student, was proclaimed 2015-2016 Female Athlete of the Year at the Gala Méritas held by the Université de Montréal Carabins on April 5. Marie-Pier had already been elected Most Valuable Player in the Canadian Interuniversity Sports (CIS) championship, thanks to her perfect 3-0 record. Her two shutouts during the tournament helped her team to take its second gold medal in four seasons. She won all her seven playoff games, allowing only nine goals during a remarkable series. Three other HEC Montréal BBA students were honoured at the Gala, winning the titles of Athlete of the Year in their respective teams: Matthieu Kennis (golf), as well as Sophie Marois and Antoine Bujold (swimming). Congratulations to all these student athletes! Guy Fréchette (HEC 1970), Chairman of the Board of the HEC Montréal Foundation, company director, Governor Emeritus and a major donor to the Carabins, winner Marie-Pier Chabot and Jean-François St-Pierre, Director - HEC Montréal Student Relations. Photo: James Hajjar Photographe.